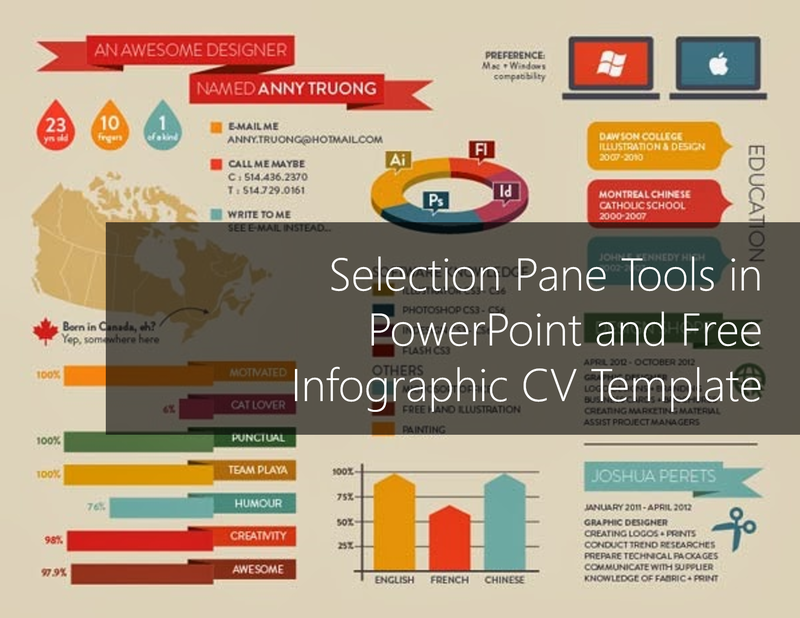 #Office365Challenge In this blog I’ll share some tips on selecting and working with multiple objects (shapes, text, objects and placeholders) in PowerPoint as well as giving you my Infographic CV template for free use. I have a crazy amount of objects on my Infographic CV and it really becomes difficult to select items when modifying items. This will definitely help you. The Selection Tool Pane will open with all the objects listed on the current slide. You can now easily select and manipulate objects. 1. Select the object – it will display on the slide as selected. 2. Click on the eye on the right and it will ‘remove’ the object (if necessary). TEMPLATE: Here’s the link to the template for free use.